Safe: 100% non-toxic, safe to use around people and pets. 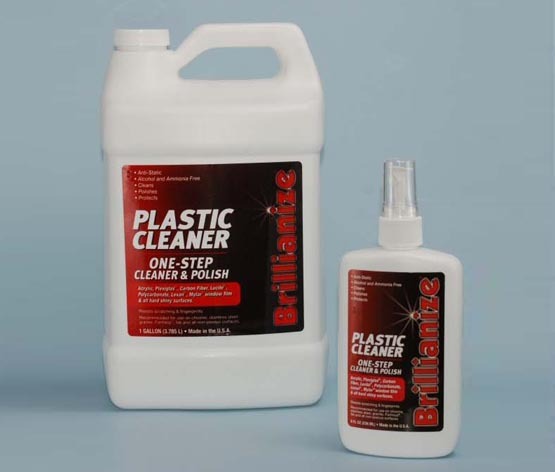 Brillianize plastic cleaner and polish is the choice of professionals, enthusiasts, manufacturers and fabricators. Our environmentally friendly formula cleans and protects all hard shiny surfaces. Quality: Brillianize contains no alcohol and no ammonia. Brillianize is specially formulated to clean, preserve and protect high performance big screen televisions, LCD and plasma displays, photo copiers, scanners, precision optics, cameras and lenses. Brillianize is specially formulated to clean today's modern plastic products without harming their surfaces.